Opening track for playback: "3dydfy://www.youtube.com/watch?fb2k_title=Mouvements&fb2k_artist=Bir%C3%A9li%20Lagr%C3%A8ne&v=6ROlGn_dZuo"
Wave cache: finished analysis of "3dydfy://www.youtube.com/watch?fb2k_title=BIRELI%20LAGRENE%20-%20Before%20You%20Go%20%5BBefore%20You%20Go%5D&fb2k_artist=Bir%C3%A9li%20Lagr%C3%A8ne&v=OKGC8CnCuVE"
Wave cache: finished analysis of "3dydfy://www.youtube.com/watch?fb2k_title=Bir%C3%A9li%20Lagr%C3%A8ne%20%22Cleave's%20Changes%22%20-%20Acoustic%20%2F%20TV5MONDE%20%5BChange%20Partners%5D&fb2k_artist=Bir%C3%A9li%20Lagr%C3%A8ne&v=SWKV8VkAkfg"
Later I'll use your last script and uncheck "Bring to front when adding new files". Yes that error seen in 0.6 beta is the same as in your previous report and its the same line causing the error. Assuming the script was not changed in a way that altered the line numbers, the error on that line number should be corrected in version 0.7. If any one has issues with foobar2000 grabbing focus, unchecking "Bring to front when adding new files" in foobar2000\preferences\shell integration can be used to stop this behaviour. Does this mean that ''add location'' will not appear anymore? With your previous version, in clean portable install DUI, i didn't have ''add location'' at all. Doesn't know how this is possible, is this because script or something else(maybe fast processing)? Also about ''track naming'', in my script metod i use didn't work as i expected. So i will use your metod -which is bether done. Script always use ''%artist% (youtube track name) [track name search], if best match isn't find. -If 'youtube track name' is: ''like a virgin'' > track name will be: ''madonna - like a virgin''. But this is not necessarily artist madonna. Also as i noticed Lowercase and Uppercase letters are also problem? Or I missed something, when testing? ''Madonna - Like A Virgin'' but only find ''maDONNa LIKE A vIRgiN'' it will say ''BAD MATCH''. I think that all this can be improved.. Anyway, this is better than mine.. I was having problems when working in applications other than foobar2000 or just when editing wsh scripts that on track change, the addition of a new track by add locations would grab focus away, e.g I would be typing away and all of sudden typing in the document would fail because foobar2000 had snatched focus. Unchecking "Bring to front when adding new files" solved this issue for me. It has nothing to do with the appearance of the add locations window when tracks are added. Since the new naming method and its faster implementation, I never see the add locations pop-up at all when tracks are added on basic or complex DUI and CUI set-ups. Track naming - yes I had noticed very occasional tracks named by the search artist that were in fact by a different artist. I could change it to show the whole title (which usually contains the artist name) in place of the search artist name if there is a bad match. I will see what works best - but I am having trouble testing an implementation because I am not getting any examples! Let me know if you have a better way. Case sensitivity - this should be correctable. Since the new naming method and its faster implementation, I never see the add locations pop-up at all when tracks are added on basic or complex DUI and CUI set-ups. I was also noticed that in DUI ''add location'' doesn't pop-up, but in CUI it appears again in xch4nge skin, probably this depends on the foobar configuration. Yes, in your script most of tracks are top tracks, all of them exist on youtube - in format: %artist% - %title%. So you can't test this. My script is different, with different tracks especially in genre mod. How to test. Find some track that your script doesn't rename properly, then modify script that receive only that track -on track change. Or you can try last.fm mode? I was testing this for days now on my script, with your track naming. But what i was trying now, is to mach only first word of %artist% and first word of %title% in 'data.title'. Example: ''Jennifer Lopez - First Love'' > will match only 'Jennifer - First' , this works in most 95% cases. Again not perfect, and some tracks are named with different artist. If i found something better i will inform you. This probably should be some complex combination. ''Madonna - Madonna - Like A Virgin - Live at MTV [Like A Virgin]'' should be: ''Madonna - Like A Virgin - Live at MTV''. I was done this, and it works good. My YouTube Album playlist is always empty? Album playlist is checked. Yes in button mode you need to enter a valid album name including the | separator in the format artist | album, since there is nowhere to display a list of albums. In panel mode this issue doesn't arise because the album names are displayed. In panel mode "Choose Artist" can be used to search for the albums of a particular artist; additionally the albums of the playing artist are shown. Double clicking an album will load the tracks. If having access to albums is important and you don't want to be looking at the panel all the time, you may want to consider putting the panel in a tab or use a button to toggle it's display with another panel. I made a trial of your script on a virgin portable foobar with button Mode "false" where I can see title and other things. Unfortunatly I don't know how to put the panel in a tab keeping the same appearance or use a button to toggle it's display with another panel. It would be better that you have albums from drop-down menu(for selected artist) in button mode, and what missing is ,get next video' in menu. By default 5 tracks are loaded in radio mode and so upcoming tracks can be viewed or played. So "next videos" are already in the playlist. If you want a different selection, double click on the last track and it will load new ones. For albums I think its much better using it in panel mode and just showing the panel on a tab toggle when required. Then there is a proper scrollable list etc. Many artists have loads of albums (nearly 70-100 isn't uncommon) and this doesn't gel well on a drop down menu, and so would be rather messy. Anyway, I will give the matter further consideration. I disagree. Anybody can use panels in simple DUI or CUI set-ups with or without tabs. In contrast button mode only works well in panel stack splitter, which is less popular. You certainly need some coding skills to put buttons in panel stack splitter. Most users of panel stack splitter do not know how to properly put in buttons. You need no coding skills to use the CUI or DUI panel and tab modes that are inbuilt into these user interfaces and so the statement that "Albums in panel mode will be only for intelligent people or programmers/coders" is the opposite of the case. Lets say I have no skill at all. and do not know where to add a panel for YT Tracker used without button mode. Now I had an horrible problem! I did "Search Youtube...", wrote artist name. It founded a lot of music but when I clicked on one title, it went in my Radios playlist (the streaming radios) and they all disappeared!! It would do. I have no control over the behaviour of the foo_youtube plugin. That menu item provides access to the foo_youtube source search box for convenience. If you double click a search item found in the box it will overwrite the active playlist, which is usually the one showing. This will happen however you access that box. You should be able to immediately use the main foobar2000 menu edit\undo to undo the change to get the original playlist back. Alternatively, drag tracks from the box to the playlist. It then should add the track and not replace the whole playlist. This behaviour is nothing to do with me. (If you haven't shut down foobar2000 you can temporarily make the playlist-v1.3 folder read-only in your foobar2000 profile location as it only saves updated changes on exiting foobar2000). foo_jesus is often recommended for regular back-ups. It will be difficult for a friend of mine using foobar on my computer. The skipping of analysis at clip info retrieving by foo_youtube if fb2k_ fields are used is important for helping to supress the add locations box that can otherwise appear during track additions. YouTube Track Manager has always sent the artist and title and with albums the album title and year as well as fb2k_fields. But a consequence of this was that tracks lengths were not appearing until a track was played. Sending the track length as a fb2k_field (3dydfy_alt_length) now ensures that the track lengths are immediately shown in the playlist. First of all it is a great extension. Added the ability to black list videos. Useful to exclude poor versions like those with significant junk before the music starts. Black listing is based on the video id number. Black listed videos will not be loaded the next time the track is added to a playlist by YouTube Track Manager, providing an alternative version is found. Note that this will not stop the loading of a particular track, just specific black listed video versions of the track. Black lists are managed on the menu - add and remove/view. The remove/view menu item toggles upon clicking between allowing removal and viewing the black listed videos in youtube so that black listed videos can be checked. Added the ability to show cover and artist images. Uses foobar2000 core settings in preferences\display\album art search patterns for front cover and artist art. Recognises foo_youtube thumbnails. There are also options to enable cycling through multiple images of an artist in properties. Double clicking an image will toggle between cover and artist images. Double clicking the text toggles the text between the now playing radio station and the artist - title of the playing track if a radio station is being played. For full details see the readme. There have been a lot of changes, so please report any bugs. Added Similar Songs mode. Plays tracks similar to a chosen track. Similar song lists are obtained from echonest or last.fm. Added option to play own music if present in media library instead of YouTube tracks (radio mode only). YouTube tracks will be used for music not in media library. To enable, set "*USER.Radio: Use Media Library" to true in properties. Fixed broken album searching due to a recent web-service change. Requires foo_youtube 1.3.1+ and wsh_panel_mod 1.5.6+. 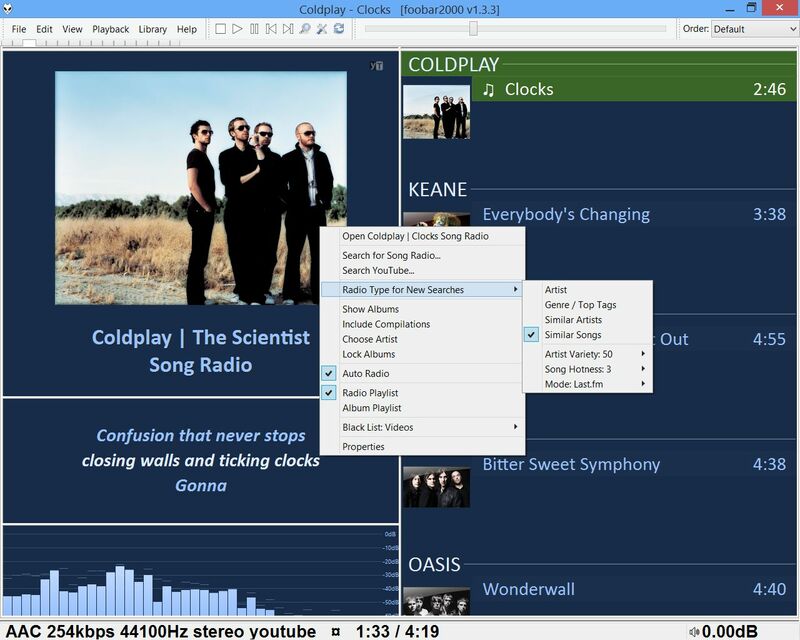 Added "Favourite radio Stations" with auto or manual management of up to 30 favourites from the menu.